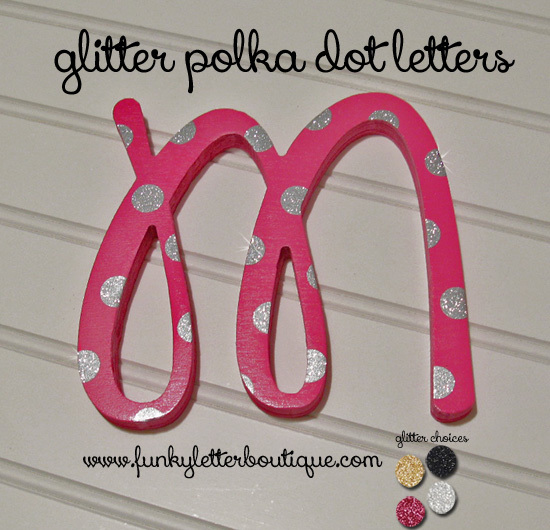 These glitter polka dot wall letters will top off any room in need of a little bling, perfectly! With extra sparkle and shine they really bring the room to life! Chose from any of our base colors and pair it with either gold, silver, black or pink glitter polka dots. Custom colors may be available contact me for more info. Sizes available: 7", 8", 10", 12", 14" prices listed below just click drop box. 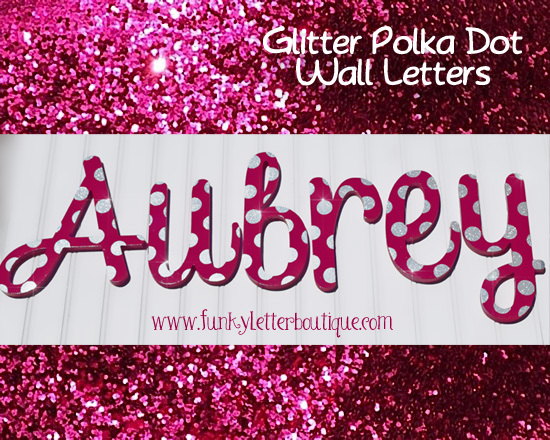 Sample: Aubrey done in sofia font. Hanging options: ribbon, sawtooths, mounting tape, or no hanging provided. Letters are made by hand by myself and take approximately 8-10 weeks for completion. If letters are needed sooner you can purchase a rush order available under tab labeled RUSH ORDERS to your left.